Madagascar, the “Great Red Island” which lies off Africa’s East Coast, is sometimes overshadowed by higher-profile destinations such as Kenya and Tanzania. If you’ve not yet ventured there, then you have missed out on a remarkable adventure and one that more than justifies the extra flight out over the Indian Ocean. There are so many things to see in Madagascar; from towering baobabs to chameleons that can fit on a match head, this destination is a living laboratory of natural wonders just waiting to be discovered. Madagascar’s landscapes are dramatic and unforgettable. The island’s sobriquet comes from its red laterite soils which are rich in iron oxide, but look up and you’ll see an incredible diversity of geography unfolding around you. 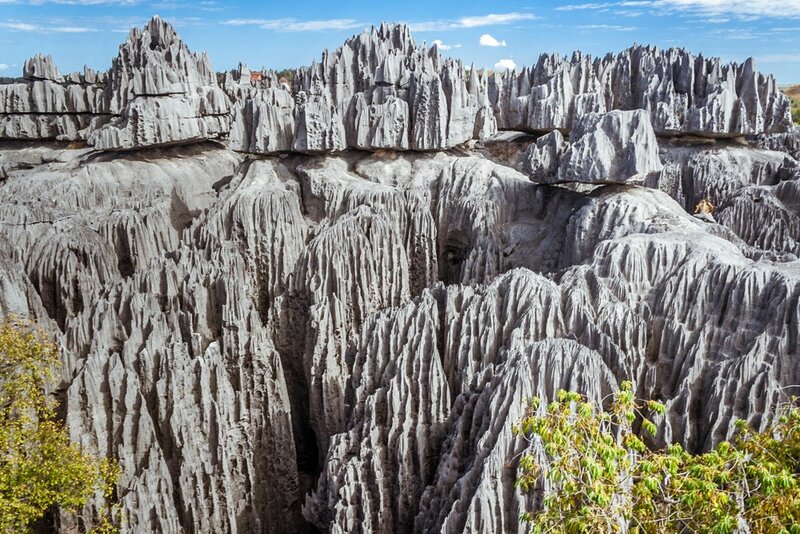 Perhaps the most striking example is the jagged limestone of Tsingy de Bemaraha National Park in the north-west, where underground water has eroded the rock into a “forest” of limestone needles, with deep fissures and ravines separating the stone columns. Known locally as the place “where one cannot walk barefoot”, it boasts a great many endemic species. Local guides have set up hanging bridges to allow you to cross the ravines, and if you really have a head for heights, you can climb some of the razor-sharp karst pillars to the top of the tsingy. Scenically speaking, this is probably Madagascar’s most desirable address. About 12 miles from the coastal town of Morondava, the dusty road passes between numerous baobabs of a species unique to the island. 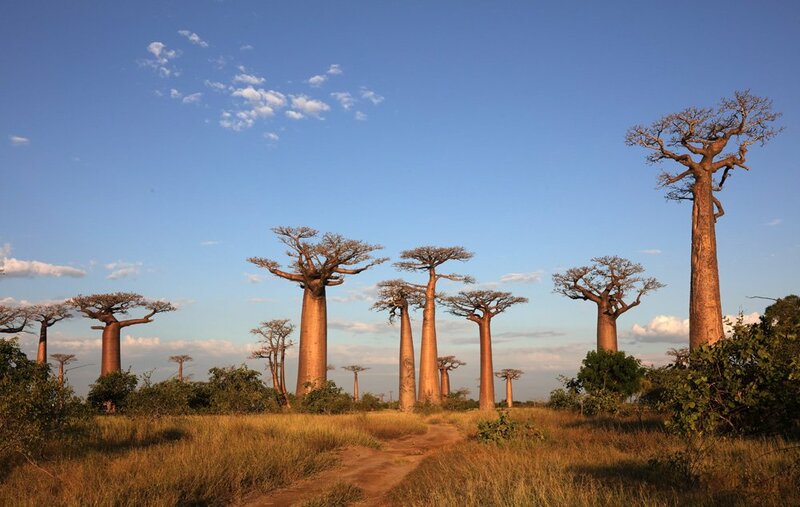 In contrast to the more squat, bulbous baobabs of the African mainland, these Adansonia grandidieri have smooth trunks rising high into the air, and topped with a crown of branches. Driving or walking slowly amongst them can really give you a different sense of scale with the grandest trees measuring up to 100ft tall. They are estimated to be up to 800 years old, and especially at sunset there is a timeless quality to the scene. Immense shadows stretch out along the ground, and iconic silhouettes demand to be photographed as you sip a local Star beer. The wonderful Malagasy word “nosy” means island, and Time + Tide Miavana on Nosy Ankao is a place you should certainly satisfy your curiosity about. Madagascar’s first 5-star eco-luxury destination is a place of sanctuary for both humans and local wildlife. 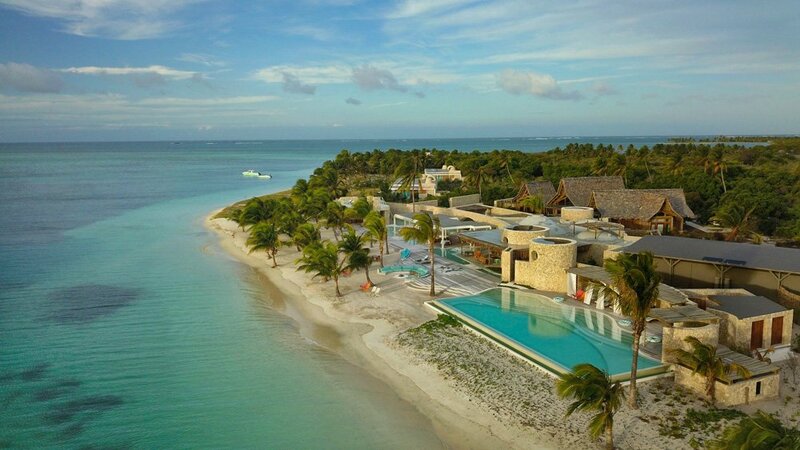 Designed and built to be sensitive to the local ecosystem, Time + Tide Miavana is a place where nature is treasured and conserved. This approach extends to the superb hospitality extended to guests. Whether you want to explore the ancient forests and look for lemurs (more on them later) or stroll hand-in-hand along a pristine sandy beach, this slice of paradise affords you the time and space to breathe and just be. If you remember the partying King Julien from the Madagascar movies, or you’re a fan of wildlife documentaries, then you can’t fail to be aware of lemurs. These endearing primates are only found on Madagascar, and come in an astonishing array of shapes and sizes (from 1oz to 20lb in weight). Their name comes from an ancient word for “ghost” but there is nothing spooky about these vegetarians. One of the best places to see them (bearing in mind that some species are nocturnal) is Lokobe National Park on Nosy Be. 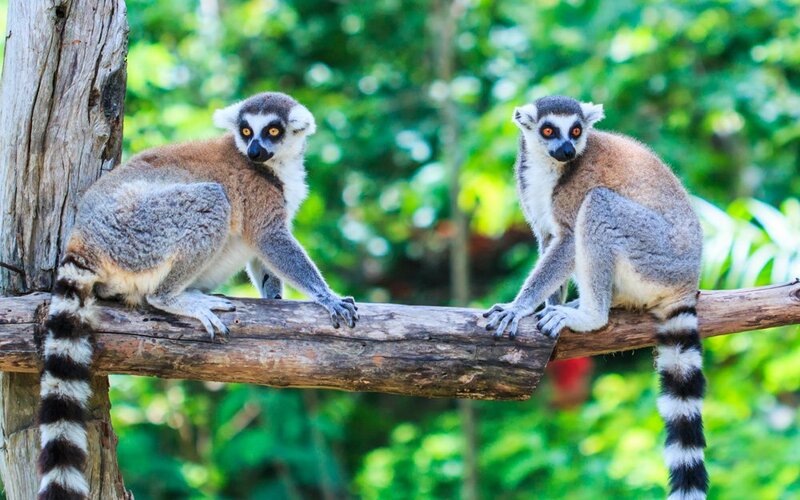 This protected lowland rainforest is famous for its population for black lemurs. They seem just as curious about humans as we are about them, and you’re most likely to spot their fluffy black faces and amber eyes peering down at you from the trees. While Madagascar is justly famed for its amazingly diverse terrestrial wildlife, the waters around it are also rich in wonders. Large areas of ocean have been proclaimed as marine reserves and as a result, Madagascar is one of the best places in the world to head out to sea in a boat to see what you can see. 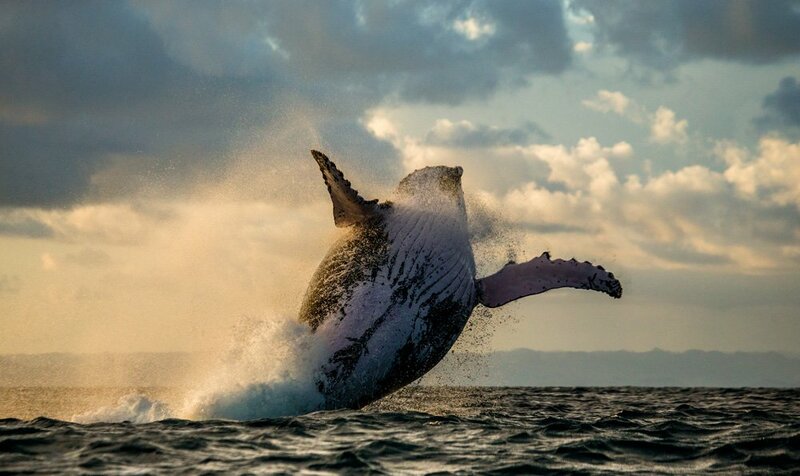 During their annual migration (July to September), humpback whales journey along the narrow channel that separates Île Sainte-Marie from the main island. These 30 to 40-ton whales come to these warmer waters to calve and breed, and indulge in breaching and blowing – so keep your cameras ready. Île Sainte-Marie has a fascinating pirate history – the captain of your whale-watching boat could well be descended from buccaneer stock! 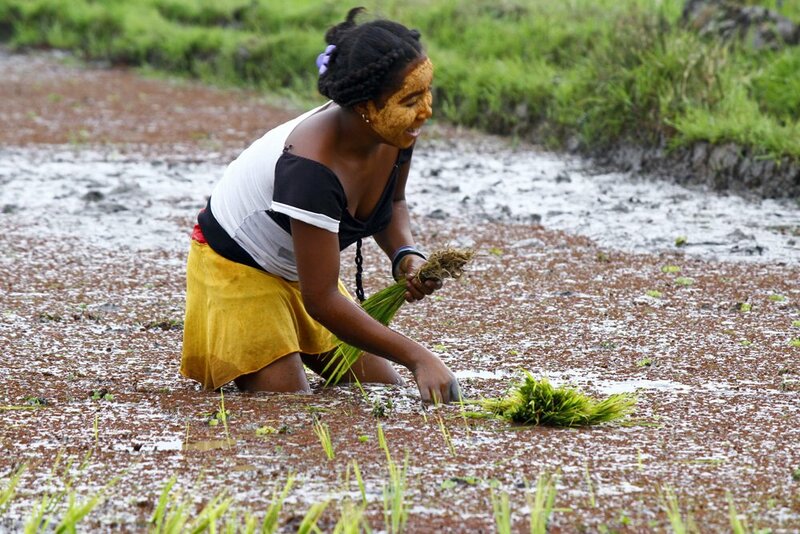 Madagascar’s unique situation – separated by water from other nations, and yet at the crossroads of trade routes between Africa, India and the Middle East – mean that Malagasy culture is a fascinating blend of influences. Wherever you travel on the island, you’re sure to be warmly welcomed – the local word for “hello” seems to be a heartfelt smile. Traditional religious beliefs are still widely practised, with Malagasy people placing particular emphasis on links with their “razana” or ancestors. There are a great number of festivals, while aspects of daily life are governed by “fady” or taboos. Although Malagasy people have a great love for life, they also attach particular importance to death, and the most striking example of this is the “turning of the bones” ceremony which although it sounds a little macabre, is actually an expression of love and respect for a late relative. This national park perfectly exemplifies the variety of terrain to be seen throughout Madagascar. 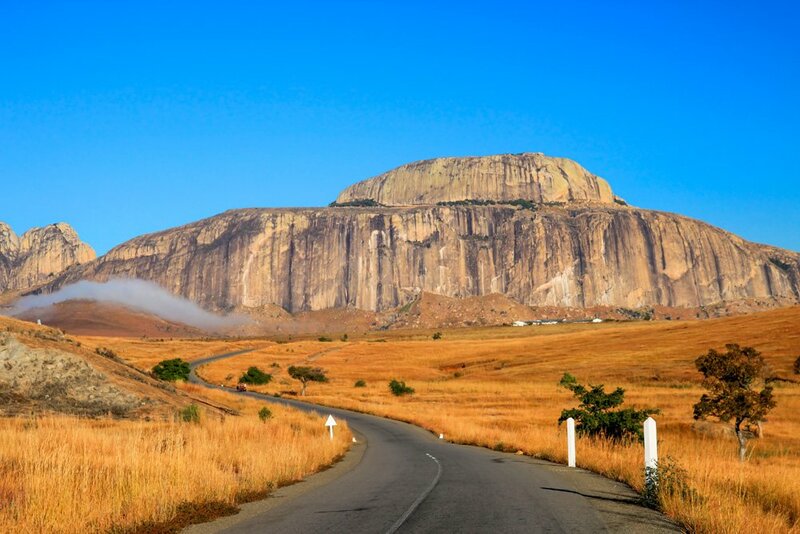 The combination of lush vegetation and arid, rocky areas makes l’Isalo intriguing to explore, and that’s before we get onto the flora (over 400 plant species) and fauna (this is also lemur country). Look out for the bizarre elephant’s foot plant (and its contrasting pretty yellow flowers) as you hike between eroded rock formations and admire standing stones. Then take a refreshing dip in one of l’Isalo’s natural swimming holes. If you get the feeling that you’re being watched, you may well be right – you have a good chance of spotting sifaka and other types of lemur looking down at you. Even with all this wildlife, it could well be the colors of l’Isalo that make the greatest impression on you, from rainbow frogs to waving golden grasses, and what are reputed to be Madagascar’s most fiery sunsets. Ready for your next big adventure? Contact us to chat about your Madagascar travel plans!